The Maya civilization extended throughout southern Mexico and into Guatemala, Belize, Honduras and El Salvador. The Maya cities reached their highest state of development during the Classic Period (c.250 to 900 AD). They continued until the arrival of the Spanish conquistadors. Although the empire is long gone, the Maya people survived the Spanish colonization and still live in the region where their ancestors did. This tale about a trickster rabbit is part of their rich cultural history. And, like tricksters around the world, sometimes the tricks work and other times life hands you a surprise. But, everyone knew Rabbit was a trickster. Everything appeared to work as it should. Together the two animals planted the seeds and then cared for the young plants. As a team they watered their crop, weeded their garden and made sure no insects came for a visit. The two friends even worked well together when it was time to harvest their vegetables. And, that’s when the problems started. But to be completely honest, Crab wasn’t totally surprised. “My dear friend and partner,” cooed the rabbit. Now, as soon as he heard that tone, hairs would have stood up on the back of his neck if Crab had any there. Regardless, he was on the alert. Something was about to happen. He didn’t know what. He might be a friend and partner, but he was no dummy. Crab knew that if something sounded too good to be true, it most likely was just that. There was nothing good about Rabbit’s offer. That big pile was a mixture of carrot tops along with a few of the bad vegetables. The smaller pile was made of only the very best of the harvested crop. “So, if you come out on top, you don’t eat any tops?” asked the crab. “Well, I think that sounds fair,” answered Crab. There are times when it is good to argue. There are times when you just need to stand up and defend what is right. This was not one of those times for Rabbit. He readily agreed to the terms. He was going to win. He was going to win easily. He wouldn’t have to share any of the carrots. And, there was nothing that Crab would be able to say or do about the agreement once defeated. Yes, Rabbit was happy. Crab’s plan was set and Rabbit just never saw it coming. Rabbit turned to take his place for the race, ten steps ahead of his friend. But, the moment he turned his head to face the carrots, the clever little crab reached out a claw and snapped on to the rabbit’s tail. He would never be able to outrun the rabbit, but Crab knew at times he could out-trick him. And, this was one of those times. The race was on and Rabbit soared ahead, thinking he left the crab in his dust. 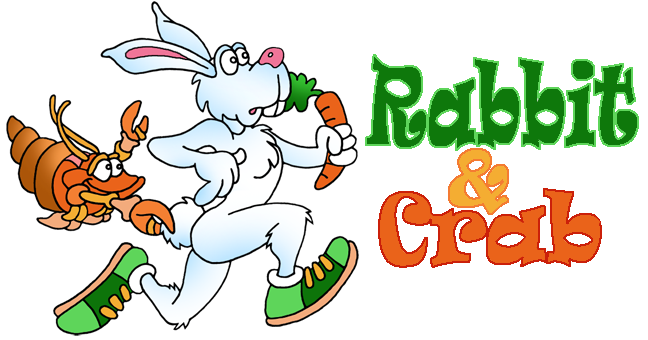 And, when that trickster rabbit reached the pile of carrots, he turned around to laugh at Crab. That was the moment that the little creature let go of Rabbit’s tail and scurried atop the pile of carrots.